If you aren’t a fan of fennel, feel free to omit it from the dish. I blended my chorizo and I wanted the flavour to infuse throughout the dish however if you don’t fancy blending it, just chop it as finely as you can manage. 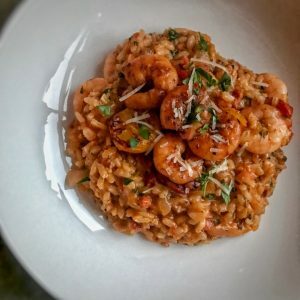 I don’t usually use oil or butter in my dishes but since an Italian chef told me that a risotto wasn’t a real risotto without both, I always now include a little of each (the oil is essential in toasting the rice so it retains a nice bite and the butter gives the risotto the creamy sheen at the end). You can see the full selection of Very Lazy products over on their website http://www.verylazy.com/ and you can purchase their products in most major supermarkets. The smoked garlic and chillies are available in Tesco now! Next, take the same saucepan; add the olive oil and onions and fry on a medium heat for 5-6 minutes until the onions are soft. Season the onions and then add the chorizo, 1 tsp of smoked garlic, 1 tsp chopped red chillies, the ground fennel and 1 tsp oregano to the pan. Fry for another 3 minutes until the chorizo has turned the onion mixture a light red colour. Next, add the tomato puree to the pan, mix in and fry for another minute. Then add the Arborio rice, stir and toast the rice for a minute. Add the wine and simmer until reduced by half. Next, mix the stock cube with the boiling water and then add 250ml of it to the rice. Stir and begin to simmer, letting the rice absorb the stock. Keep adding the stock a little at a time as it absorbs until you have used it all (this should take around 25 minutes – you made need a little more or a little less depending on the heat of your hob). Once most of the liquid has absorbed, and the rice is cooked nicely, reduce the heat to very low and add the parmesan and butter. Stir through, taste and then season with salt and pepper to your taste. Leave the risotto on a very low heat whilst you cook the tomatoes and prawns. Spray a non-stick frying pan with 1kal and add the tomatoes cut side down. Season with salt and pepper and fry for 3-4 minutes until the tomatoes have a nice colour on the cut side. Add most of the tomatoes to the risotto, reserving a few to dress the dish at the end. In the same frying pan, spray with 1kal and add 1 tsp of smoked garlic and 1 tsp crushed red chillies. Add the prawns and fry for a couple of minutes on each side until cooked through. Turn the heat off the prawns and squeeze over the juice of ½ lemon. Add most of the prawns to the risotto (use a spoon or fork as you don’t want all the extra chilli and garlic in the risotto pan), reserving a few to dress the dish at the end. Finally, remove the risotto from the heat and add the juice of ½ lemon and the fresh parsley. Stir through and then serve in a bowl topped with the reserved tomatoes and prawns. Please note, this recipe forms part of a paid collaboration with Very Lazy however all views on the products are my own. I’ve probably missed it, but at which point do the fennel seeds go back in? Yet another winner! Made this last night, amazing! So good my teenage daughter has the left over portion for lunch! So tasty!